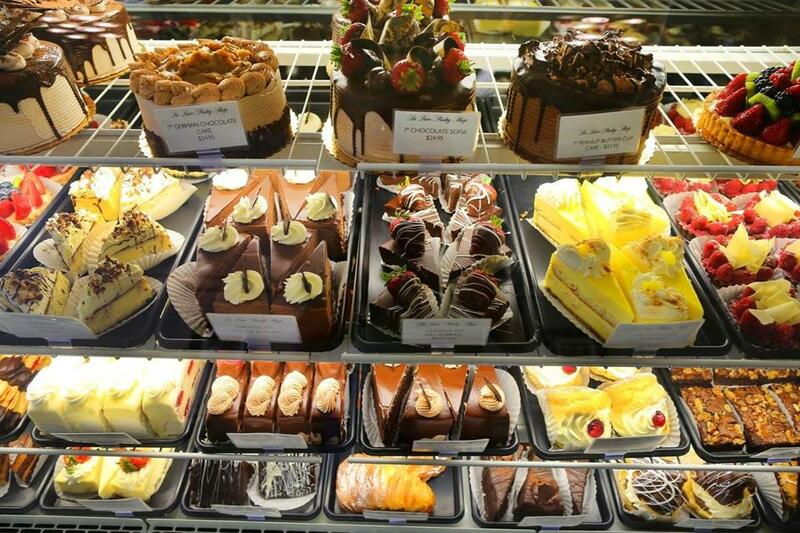 Walk into La Luce, a European-style pastry shop that opened in Dedham Square in April, and your eyes will immediately be drawn to the pastry- and dessert-filled case running the length of the store. First up are the breakfast treats. The sticky cinnamon-filled “cro-cinna roll” ($3) is already a favorite among customers, and it’s easy to see why. It’s crafted from croissant dough and cinnamon sugar, all wound together in the classic cinnamon roll shape. The thick cinnamon swirl is fragrant and intense. For another sweet option, there are chocolate croissants ($3), while those seeking a little something less sweet for breakfast will find an assortment of savory croissants, as well as plain croissants. 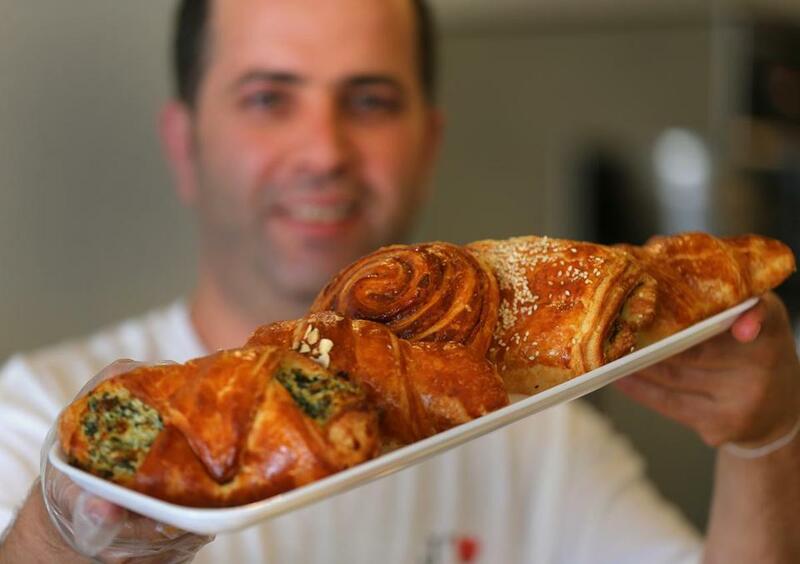 Owner and chef Elias Saade said he makes his croissants with real butter and the process takes three days. The soft, buttery croissants are just flaky enough to leave a small pile of shards behind as evidence that they were quickly devoured. While the plain croissants ($2.50) are plenty delicious, the spinach and cheese croissant ($3) offers a little more. This flaky pastry gets filled with a creamy, garlicky mixture of spinach, ricotta, mozzarella, and Parmesan. Even more interesting is the sesame, thyme, and za’atar croissant ($3). At first, Saade would cut up a few of these croissants and offer samples to customers. Now, he says, the croissant is very popular. The herby filling offers a lemony hit, which Saade noted isn’t from lemon but from sumac, a Middle Eastern spice. After pulling away from the display of croissants, customers can find some Lebanese pastries, such as pistachio-laden baklava ($9 per pound) or namoura ($6 per pound), syrup-soaked semolina cakes, which Saade said are made with family recipes. Muffins are also among the breakfast offerings, and an oversize blueberry muffin ($2) with sweet, buttery flavor is moist and vanilla-scented. Half-moon-shaped apple and raspberry turnovers ($2), with traces of their filling decorating the pastry exterior, sit beside the muffins. In the next section of the case are rows of beautifully decorated cakes, both whole and sliced. The Princess Helena satisfies chocolate lovers with layers of chocolate cake and chocolate frosting all covered in chocolate ganache, while the Princess Sofia feels lighter, with layers of vanilla cake, strawberry filling, and whipped cream frosting covered in white chocolate ganache and decorated with a white-chocolate-covered strawberry. Both cakes are named after Saade’s daughters. There are also traditional options like carrot cake and chocolate mousse cake. The latter, Saade reveals, is his favorite. In the last section are cupcakes and lots of miniature pastries, from eclairs ($1.50) to cannoli ($2). The small cannoli are available plain and chocolate dipped and feature a barely sweet homemade ricotta filling. The chocolate-dipped shells hold their crunch nicely. Little squares of cheesecake with chocolate cookie crumb crusts are creamy and decadent with a thin chocolate layer on top. Customers can pick up a party tray (18 pieces for $25), featuring a selection of these diminutive pastries, to get a broad sampling or to bring to an event. Saade will create customized cakes or desserts for his customers, and can work off a photo and adapt the details. He showed off a special order that featured a bouquet of pink, chocolate-dipped strawberries and a box of cupcakes with twirls of pink frosting. Black quins (flat, round sprinkles) were tucked into the frosting to mimic mouse ears for a spin on Minnie Mouse cupcakes. Saade said he starts his day by making Turkish coffee at home and bringing it in a travel mug on his commute to the shop, where he arrives at 4 a.m. He has just one set of helping hands in the kitchen, so mornings are busy and the strong coffee helps. Up front, the friendly counter staffers are eager to help customers make selections. They know what’s in the cakes and pastries, and Saade said he encourages questions. While La Luce already has so many baked goods to choose from, as the weather cools down, Saade also wants to start making chocolate truffles and French macarons. The small pastry shop has five tables inside and two outside, making it well-suited for picking up a quick snack to go or a sweet treat to bring to a party, or for sitting down to a quick breakfast of coffee and an enticing croissant. Megan Ginsberg writes about food online at www.megan-deliciousdishings.blogspot.com.